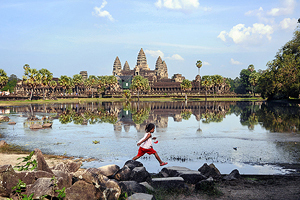 In 928 Koh Ker became the capital of the Khmer empire, during the reign of King Jayavarman IV. The landmark of Koh Ker is the perfect step pyramid belonging to the vast complex of Prasat Thom. More than a dozen temples can be visited. Among temple towns of this size, Koh is the only one that remains untouristed. Compared to earlier examples, many sandstone towers in and around Prasat Thom are of enormous size and, besides Phnom Bok in Angkor, sheltered the largest Lingas known in Cambodia. The French archaeologist Lunet die Lajonquière came to the conclusion, that, given the limitations of Khmer constuction techniques, the use of wooden carpentry had to be extended in Koh Ker. A characteristic of both architecture and the sculpture of Koh Ker is the use of huge blocks of stone. Sandstone was abundantly available in this area and, compared to Angkor, there was less of a problem in moving it. Nevertheless, brick still predominant as material, but the use natural stone, sandstone and also laterite, was increasing. Square ground plans were the most common, but rectangular buildings occur more often than in previous periods, from now on not only for galleries, but for libraries and other kinds of edifices, too. In particular, the evolution of galleries, only hinted at in earlier periods, makes some advance at Koh Ker’s principal temple Prasat Thom, both in the almost continuous series of gallery buildings of its second enclosure and in the uninterrupted semi-open column hall of Prasat Thom's exterior gate. The arrangement of towers in quincunx, which began at the Bakheng and became a favourite pattern for some time was less predominent in Koh Ker, however, it occurs at Prasat Krachap. All the monuments in Koh Ker are dedicated to Hindu deities, mainly Shiva. Remarkably, there are no shrines for the Buddha. This is in contrast to earlier and later periods of Khmer history, when the Buddha, besides Shiva and Vishnu, used to be venerated as one of the three most important supernatural beings “imported” from India - despite the fact that in this country of origin the Buddha was regarded as unorthodox or even heretical by devotees of Shiva and Vishnu. To the north and west of the Rahal and oriented like it are the remnants of a walled enclosure. Like in Angkor, the fortified part of the city formed only the core of a much larger settlement. The walled city covered an square of about 1.2 km width. This capital of Jayavarman IV included the main temple complex, Prasat Thom, within its walls, whereas almost all other important sanctuaries are situated outside the city walls. The very centre of Koh Ker is a former freshwater reservoir called Rahal Baray, now dried up. Not much can be seen at its site today, but it is worth mentioning and helps to understand the layout of Koh Ker. And indeed the laterite embankments are the largest structure in Koh Ker. The Rahal Baray is located to the south of Prasat Leung and Prasat Thom. It is 1,200 m long and 560 m wide. This is not nearly as huge as Angkor’s East Baray, which was constructed a few decades earlier, it ie even smaller than the first notable Khmer reservoir, the Indrataka in Roluos. But the Rahal Baray in Koh Ker was far more difficult to engineer, since the topography required it to dig part of it from solid rock. The artificial reservoir is an expansion of the valley of a small affluent of the Stung Sen river, flowing into its northeast corner from the north and out of its south-eastern corner towards the south-east. Furthermore, the topography is the reason for the unconventional orientation, north-south instead of east-west and slightly shifted, 15 degree west. The unusual orientation of the Rahal Baray in turn determined the even more unorthodox orientation of the walled city and of the temples of the northern an northwestern groups of edifices. The purpose of the Baray was evidently to provide a supply of water for the irrigation of paddy cultivation, though the irrigation function of Khmer Barays was disputed by archaeologists. Several ponds to the north, north-east and west seem to be the remains of irrigation works. Remains of a laterite sluice are still visible. 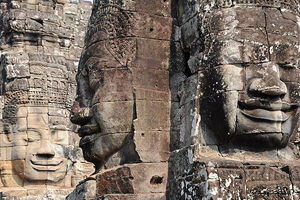 The temples of Koh Ker can be considered in three groups. Prasat Damrei and neighbouring large temples are usually ascribed to the northern group, but some guidebooks and websites count them among the southern temples. Prasat Thom is Koh Ker's largest temple compound. Prasat Thom in a narrow sense is only a part of the whole complex of the imperial temple, namely the concentric temple with three enclosing walls and a wide moat. To the east of it is the gate called Prasat Krahom and the so-called palaces. Immediately to the west of the core temple Prasat Thom is the step pyramid, landmark of Koh Ker, and the artificial mound called tomb of the white elephant. Prasat Balang at the northern end of the northern temple group is a good example among five quite similar Linga shrines. The Lingams inside these temples are of enormous size. 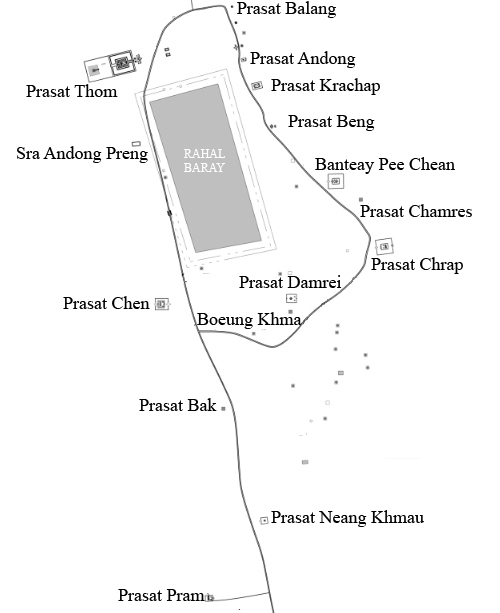 Prasat Krachap is one of the four larger complexes of the northern group. Prasat Krachap has well-preserved inscriptions,for example at the western entrance gate. Prasat Banteay Pirchan (Banteay Pee Chean) is the only Khmer temple complex dedicated to Brahma, who is part of the so called Trimurti of highest Hind gods. 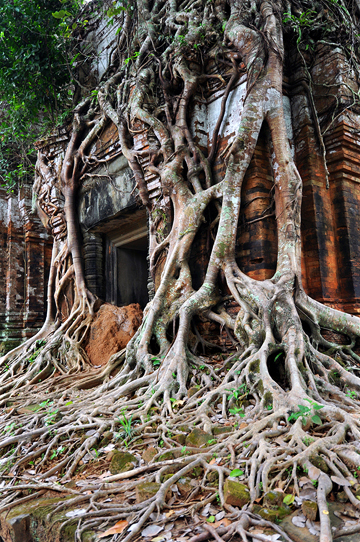 This is one of the most picturesque ruins of Koh Ker. Prasat Chrap has a typical row of three Prasats. 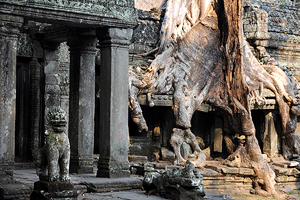 Prasat Damrei is famous for its elephant and lion sculptures. Prasat Neang Khmau is built o laterite, the stone became bluish and dark due to oxidation. ﻿Prasat Chen﻿ (Chin) got its name "chinese temple" because of the queus of hair of remarkable statues found here, Koh Ker's "fighting monkeys" are now on display in the National Mueseum in Phnom Penh. Prasat Pram (Bram) is the fairy tale temple of Koh Ker, the roots strangling the north-western Prasat are like in a picture book of a temple lost in the jungle, see it on the photo above or as the title photo of this website.